There was a time when LEGO sets were just for kids. Those days are long gone. Sure, kids can still enjoy them, but some of the sets are so elaborate and expensive that no kid could ever hope to enjoy them. Or at the very least afford them. Speaking of that, LEGO has just unveiled their largest set ever, and it is going to be very attractive for Star Wars fans. The new Ultimate Collector Series Millennium Falcon is truly massive and is absolutely awesome. As revealed by USA Today, the Ultimate Collector Series Millennium Falcon consists of 7,541 pieces, making it easily the largest LEGO set ever released. The previous record holder was the LEGO Taj Mahal set, which had a still incredible 5,922 pieces. The previous Millennium Falcon in the series, which was released in 2007, had 5,197 pieces. That is still a lot, but it pales in comparison to this new set, which is about 30 percent larger. So what did LEGO do with all of these extra pieces? They added a whole lot of details. 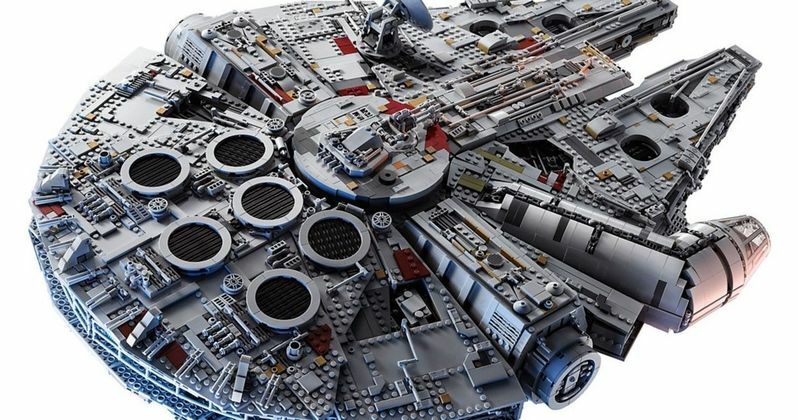 The new Millennium Falcon set measures 33 inches long, 22 inches wide and 8 inches tall and features an incredibly detailed interior that fans of the Star Wars franchise will recognize. Just as in the movies, the cockpit of this LEGO Falcon holds four figures and there is the living room setup, complete with chairs and Dejarik game board. So who are you going to be able to put in the cockpit of this LEGO Millennium Falcon? The set comes with Han, Princess Leia, Chewbacca, C-3PO from The Empire Strikes Back era. The set will also feature an old Han, Rey, Finn and BB-8 from Star Wars: The Force Awakens. And don't worry, the set will also come with a couple of Porgs, which are going to make their debut in Star Wars: The Last Jedi on December 15. Speaking of Star Wars: The Last Jedi, this set has made its way online just ahead of Force Friday, which will see the release of a ton of new toys for the movie. Lucasfilm and Disney have a ton of events planned for the event and these new toys are sure to reveal lots of secrets about the upcoming sequel to Star Wars: The Force Awakens. However, this Ultimate Collector Series Millennium Falcon sadly won't be hitting shelves on September 1. LEGO is going to unleash this monstrous set on October 1. So the big question; what will this new LEGO Millennium Falcon set cost Star Wars fans who want to add it to their collection? Better do some penny pinching, because the big set comes with an equally big price tag of $799.99. That may be an awful lot of money, but there is an awful lot to love about this LEGO set. You can check out the images of the new LEGO Millennium Falcon for yourself below, which faithfully recreate scenes from the Star Wars with the new set.